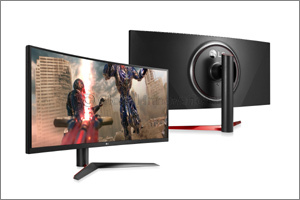 Dubai, UAE, December 20, 2018: At CES next month, LG Electronics (LG), is set to unveil its latest “Ultra” monitors which include both UltraWide for outstanding productivity and UltraGear for enhanced gaming. Building on its reputation as a leading innovator in the UltraWide (21:9 aspect ratio and higher) monitor category, the impressive expanse of the new 49-inch LG UltraWide Monitor (model 49WL95) is built to boost productivity for any task while LG’s latest UltraGear Gaming Monitor (model 38GL950G) combines superb picture quality with blazing speed to deliver the immersive experience gamers demand. LG’s newest UltraWide Monitor features a large, 32:9 aspect ratio curved screen that delivers exceptional picture quality. With its cinematic scale, LG 49WL95 is a high quality solution that replaces the cumbersome multi-screen setup. The additional space supplied by its 49-inch display and incredible aspect ratio makes the LG UltraWide ideal for multitasking. A pixel count of 5120 x 1440 (equivalent to two 27-inch Quad High Definition side-by-side) and 108 pixels per inch (PPI) ensures optimal image clarity, meaning documents are easier to read and videos and image files, easier to edit. LG’s UltraWide Monitor is a true productivity-boosting tool. Suitable for any type of work, this monitor is a natural fit for those working in finance, IT, design and architecture where display accuracy and quality are required. Utilizing LG’s industry-leading IPS technology, the latest UltraWide Monitor offers stunningly accurate color reproduction covering 99 percent of the sRGB color space. With support for HDR10, this monitor is also capable of displaying HDR-enabled games and video.